6:45 p.m. ET | This afternoon, Jeffrey Brown talked with Damascus-based human rights lawyer and advocate Razan Zaitouneh, who said there are security checkpoints throughout the capital and in nearby suburbs and towns. Some communications have been cut, and hundreds have been arrested around the country. During the crackdown…yesterday in several cities [they were] killing people was continuing in Daraa. And Douma was under siege. People got to street to protest in several cities yesterday evening. Today also there is a protest in ElKomishi, in Latakia, in Banias. It seems clear that people are insisting on going on, to continue. And they are not afraid anymore. This crackdown now might affect the cities which the military and security are inside; the cities like Douma and Maadoumia. It’s impossible now for people to go to the street because, no one can even walk in the street. But in other cities people are continuing and going on. We try all methods we have. We use internet, we use phone when we can. We get face to face when we can. We use everything we can to keep the movement on, to keep people aware of what’s going on in the other cities. Because this is very important thing to encourage people around the country to know that they are not alone and other cities are continuing moving going on. 2 p.m. 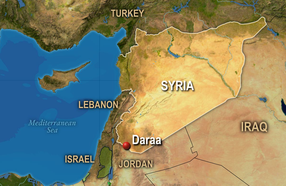 ET | Britain, France, Italy and the United States are expressing growing concern about the Syrian government’s heavy handed response to protests in the southern city of Daraa, where witnesses report sniper fire, tanks, and dead bodies in the streets in another deadly escalation of the country’s unrest. Security forces appear to be stepping up their campaign against protesters in Daraa in an effort to eradicate a more than month-long series of protests, arresting those suspected of being involved in morning raids and placing army units throughout the city. Despite concessions, including lifting the country’s decades-old emergency law, protesters are demanding that President Bashar al-Assad leave office. The government has blamed the unrest on extremist elements and has vowed to put a stop to any further demonstrations. An estimated 400 people have died in the violence, though exact numbers are difficult to ascertain due to severe restrictions on media. Mobile phone access and other forms of communication have also been restricted, according to media reports. In a news conference in Rome, French Prime Minister Nicolas Sarkozy and Italian Prime Minister Silvio Berlusconi criticized Assad’s brutal crackdown. British Foreign Secretary William Hague said Britain and its European allies were discussing the situation and possible punitive measures. “This violent repression must stop. 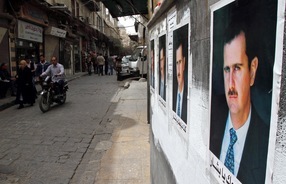 President Assad should order his authorities to show restraint and to respond to the legitimate demands of his people with immediate and genuine reform, not with brutal repression,” he said. The United States is urging its citizens to evacuate, and arranging for the departure of non-essential diplomatic personnel and their families. Witnesses report smaller scale crackdowns near Damascus and in the city of Jableh to the north, although Daraa has become a focal point of the clashes. The largely poor and drought-prone city was home to the earliest protests. According to Jon B. Alterman of the Council on Foreign Relations, the U.S. is concerned on several fronts: the possibility of instability in Syria boosting Iran’s influence, and its relationship with neighboring countries that have an interest in his remaining in power. “Syria is Iran’s closest state ally in the Arab world – there are also non-state allies [like] Hezbollah [in Lebanon] and Hamas [in the Palestinian territories]. I think the fear of many is that a post-Bashar Syria would actually empower non-state proxies of Iran to action and in the net, help Iran in the Arab world,” he said in an interview on the group’s site.